Remove any dirt or foreign matter from the wheel contact surface. 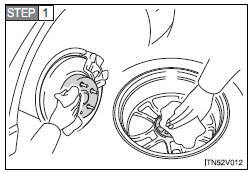 If foreign matter is on the wheel contact surface, the wheel nuts may loosen while the vehicle is in motion, and the tire may come off the vehicle. Install the spare tire and loosely tighten each nut by hand to approximately the same amount. 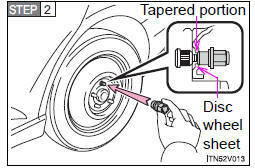 Tighten the wheel nuts until the tapered portion comes into loose contact with the disc wheel sheet. Firmly tighten each nut two or three times in the order shown in the illustration. • The compact spare tire is identified by the label “TEMPORARY USE ONLY” on the tire sidewall. Use the compact spare tire temporarily only in an emergency. • Make sure to check the tire inflation pressure of the compact spare tire. As the spare tire is not equipped with the tire pressure warning valve and transmitter, low inflation pressure of the spare tire will not be warned. Also, if you replace the compact spare tire after the tire pressure warning light comes on, the light remains on. Install the compact spare tire on the rear of the vehicle. Perform the following steps and fit tire chains to the front tires. the tire removed from the rear of the vehicle. 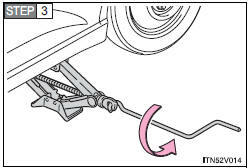 Improper use of the tire jack may lead to death or serious injuries due to the vehicle suddenly falling off the jack. • Do not use the tire jack for any purpose other than replacing tires or installing and removing tire chains. • Only use the tire jack that comes with this vehicle for replacing a flat tire. • Always check that the tire jack is securely set to the jack point. • Do not raise the vehicle while someone is in it. • When raising the vehicle, do not put an object on or under the jack. • Do not raise the vehicle to a height greater than that required to replace the tire. • Use a jack stand if it is necessary to get under the vehicle. • Do not put any part of your body under the vehicle supported by a jack. • Do not start or run the engine while your vehicle is supported by the jack. 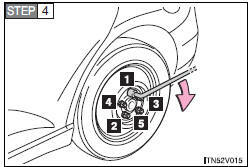 • Do not touch the disc wheels or the area around the brakes immediately after the vehicle has been driven. • Failure to follow these precautions could cause the wheel nuts to loosen and the tire to fall off, resulting in death or serious injury. • lbf (103 N• m, 10.5 kgf• m) as soon as possible after changing wheels. Failure to follow these precautions could cause the nuts to loosen and the wheels may fall off, which could lead to an accident causing death or serious injury. In cases such as when replacing tires, make sure to turn off the power back door main switch . Failure to do so may cause the back door to operate unintentionally if the power back door switch is accidentally touched, resulting in hands and fingers being caught and injured. • Remember that your compact spare tire is specifically designed for use with your vehicle. Do not use your compact spare tire on another vehicle. • Do not use more than one compact spare tire simultaneously. • Replace the compact spare tire with a standard tire as soon as possible. Do not drive at speeds in excess of 50 mph (80 km/h) when a compact spare tire is installed on the vehicle. The compact spare tire is not designed for driving at high speeds. Failing to observe this precaution may lead to an accident causing death or serious injury. Also, not only can the AWD system not be utilized fully, it may actually negatively effect the drive-train components (AWD models only). Do not fit tire chains to the compact spare tire. • Replace the grommets for the tire pressure warning valves and transmitters as well.